It’s Official! We have legally changed our name to: Yogie and Friends FIV+ Cats Sanctuary. We knew we would be changing our name once we no longer had any exotic cats. We added the Domestic Animal Project (D.A.P.) as a division of our organization back in 2005. We have been Yogie and Friends since 2000. We felt it was a brand many know and wanted to maintain it. So, here we are. Sam: We took three cats in for physicals the other day and got Sam retested for FIV/FeLV. Whenever we get young cats that have tested positive we always retest them several months later. Many young cats test positive because of their mother’s antibodies and come back negative later. Well, this is the case for sweet Sam. We were thrilled that his retest came back a big, fat, NEGATIVE! Yay! We asked our friends at Port City Cat Rescue (PCCR) if they would take Sam for us and place him up for adoption. They have agreed to do so, and they will take him to their rescue in about a week. PCCR has an adoption area in Petco and they also have a large facility within the Shreveport city limits that people go to adopt. They are in a much better place to do this for us. We will miss this sweet little guy, but we hope he gets adopted to a family that will spoil him like crazy! New Cat Building: The new cat building is so close to completion. 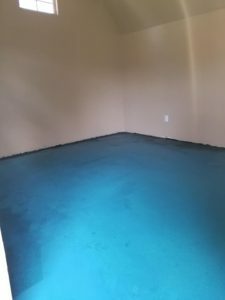 We painted a special water sealant on the floor the past two days as an extra added protection prior to putting the vinyl plank flooring in. 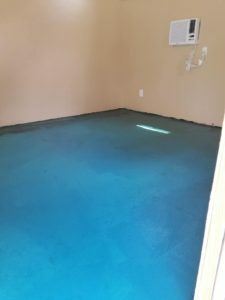 This was recommended by a friend who is a home builder and we felt it was an excellent idea. The only things remaining to be completed inside the building is the two lofts, window and door trims, and the floor. When the inside is complete we will bring the cats in. We will then look at completing the outdoor enclosure later, but the sooner we get the cats inside, the better. Facebook: Please like and follow us on Facebook at Yogie and Friends FIV+ Cats Sanctuary. It is a strictly controlled page so that nobody is every bullied or threatened on our page by others. It’s a safe page to share educational information and news about our wonderful cats. Please like on the page and share with your friends.